Have you heard of Breyer’s new Delights line of ice creams? They are sweetened with stevia and are a lower calorie ice cream with no artificial ingredients. 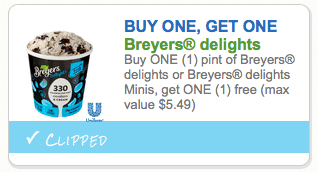 AND, there’s a new BOGO coupon for this new ice cream! You can print two copies per device (including mobile). You should be able to find this ice cream at most stores for around $5 a pint, so $2.50 after coupon!